Cobalt 27 Capital CEO Anthony Milewski talks about the company’s recent IPO, the future of cobalt and how investors can profit. Canada-based Cobalt 27 Capital (TSXV:KBLT) started trading on the TSX Venture Exchange on Friday (June 23) after a C$200-million initial public offering, the largest in Canada since 2012. The company aims to offer investors access to physical cobalt, a key element in the lithium-ion batteries used to power electric vehicles (EVs). Cobalt prices have gained more than 70 percent since the beginning of the year, and are expected to soar in the next decade on the back of higher demand for EVs. Currently there are many cobalt-focused companies trading on the TSX and TSXV, but because Cobalt 27 offers direct exposure to physical cobalt, it presents a different opportunity than investing in exploration and mining stocks. The company owns close to 2,160 tonnes of cobalt CBD3, which will be stored in secure warehouses in Europe and North America. The company’s holdings come from a group of investors, including Pala Investments, a Switzerland-based mining fund that has been buying cobalt since last year. Cobalt 27 also plans to make streaming deals with cobalt-producing companies, and has already acquired royalties on eight exploration-stage properties containing cobalt. That will result in significant growth in the future, the company says. “[Cobalt 27] provides investors with a large-scale, liquid way to play cobalt. 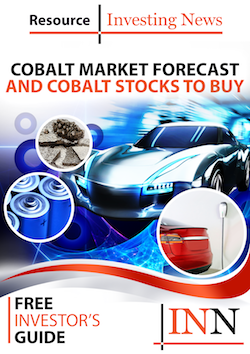 [Investors] are getting the access to physical cobalt, which is hard, if not impossible, to get,” CEO Anthony Milewski said via phone, adding that cobalt is the best way to play the electric car thematic. “EV penetration will be significantly greater than anyone anticipates, and adoption will happen faster than anyone anticipates,” he explained. In fact, analysts at UBS (NYSE:UBS) recently raised their forecast for global sales of EVs in 2021 to 3.1 million units from 2.5 million, and to 14.2 million units in 2025. In total, surging demand for EVs is expected to push demand for lithium-ion batteries above 400 GWh by 2025, Benchmark Mineral Intelligence says. And as that happens, the need for cobalt is expected to soar. Currently most cobalt is mined in the Democratic Republic of Congo, a politically unstable country, but according to Milewski, investors can expect some diversification as projects in Canada and Australia come online. However, for that to happen, the market will need to find an incentive price that will allow those mines to be built. The company has already received some votes of confidence. “[Cobalt 27] needs a pipeline of secure supplies,” Frances Hudson, global thematic strategist at Standard Life Investments, told Reuters, referring to the company’s potential for investors looking for a piece of the cobalt action. “If the cash flows are there and they can pay a dividend, then this would be a sensible way to do it,” she added. The company’s share price hit a high of C$9.50 on Friday and is currently trading at C$9.15 from an initial offering of C$9.